Just so we’re clear – ‘here in the real world’ – yes, insurers DO predictive analysis, but they don’t USE predictive analysis. Think about this for a moment – the overall cost of ‘losses’ have declined over the past decade. Yet, carriers AL&E and Expenses have increased by double digit figures. How is this possible when computers and automation have brought down the transaction costs of every other industry? How is this possible – simple: Work comp insurance, unlike any other, is a ‘closed system’. In order to ensure the participation of private carriers, each state manipulates the ‘base rates’ to make sure the carriers make a profit – else they would exit the system. Thus, over the long term (not one or two years isolated), the carriers are guaranteed a profit – a return on the capital invested. What determines the ‘capital invested’ – it is the ‘Surplus Ratio’ that carriers must have as a function of their losses. The more capital deployed, the higher the ‘return on capital’ must be to ensure the carriers participate. In a world where the ‘risk free return’ (RFR = 10 Year US Treasury Bonds) is less than 1%, the work comp carriers (according to the NCCI) are whining about a 5.6% return (down from 14.2%). So, the goal of the carriers is to deploy more capital. How do they do that – by showing ever increasing losses. The losses aren’t increasing because of benefits paid to injured workers – they have to come form LA&E. At a 5/2% ROI, capital is flooding into the work comp carriers from all parts of the world. Their only problem is how to deploy it. Carriers will never use analytics to reduce costs – it is not in their interest or to their benefit. There is a Chinese saying, ‘When a human points at the moon, the dog looks at the finger.’ Please, stop looking at the finger. It’s true that workers’ compensation cost as a percentage of payroll has declined dramatically since the early-to-mid reforms in the 1990s. I intend to write a blog about that. Automation itself has a limit to how much money it can save. Automation supports predictive modeling for obtaining data, but, as you know, is not the same as the models or the modeling processs. Most workers’ compensation insurers are using predictive modeling to locate, attract and retain the most desirable markets. Applying predictive models to the claims process, however, does help reduce losses. 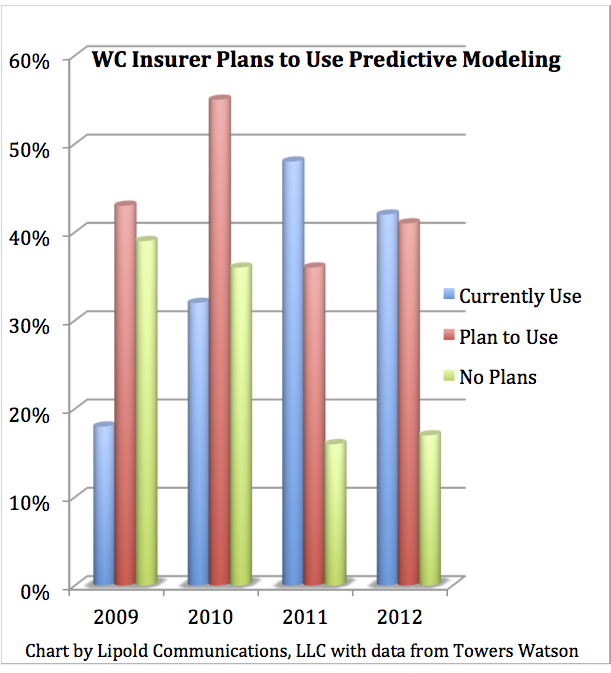 I discussed this in last week’s blog on predictive modeling for self-insurers. Some workers’ compensation carriers and TPAs are getting on board with this and seeing ROIs of 1 to 4 percent. How it will affect the rising frequency trend will be interesting to see. Please check out Workers’ Compensation Predictive Modeling Comes of Age article under the “work samples” tag. It should provide you with more information.